Delsey vs Samsonite: Who Makes The Best Suitcase? There are so many suitcase brands out there, it is hard to know which one to buy. Some of the best like Delsey and Samsonite are often tough to compare because they are so similar. Your suitcase needs to be easy to carry or push, fit all your stuff easily, not be too heavy and not cost an arm and a leg. That is why in this post I am going to show you exactly what matters with these suitcase brands, and you can then easily figure out which one is right for you. Before you start comparing suitcases you need to know roughly what size (or sizes) you need. ​I usually have two of these sizes so that I can choose depending on the trip. If you travel alone, you could go with the 20 and 24 inch (one for carry on and one for check in). If you are a couple or family the 28 inch is ​a must. Maybe even two for a family. These days suitcases are not nearly as heavy as they used to be. This is because of the materials that the suitcase manufacturers have started making them out of: Polycarbonate. This is a super-light material that is still very strong. Most of these suitcases are made from very strong and durable materials, which makes them perfect for the knocks they has to take during travel. However, you want to watch out for the small things that are going to break over time. For me, the first thing that usually goes is the zipper or at the very least the zipper tab. It tends to get caught in things like the luggage belts or just crushed under other suitcases on a plane. Last but certainly not least is price. A lot of these suitcases are quite similar and the price is just down to the brand. Not always, but most of the time. ​In the end, you have to decide how much you are willing to fork out and if there is any major difference that worth the price of one over the other. Samsonite is the king of luggage. They are extremely well known, and for good reason. They produce a quality product, and were even voted best suitcase on Tripadvisor in 2016. When it comes to materials, Samsonite usually use top quality materials for both the case, the interior linings and the zippers. As a result, these cases will last a long time which often offsets the extra m​oney you have paid for the case (if you think price per year of use). The Samsonite Omni PC range of suitcases are pretty darn good. They are quite simple, but also strong, durable and have enough features to keep most travelers happy. The Samsonite Omni suitcases use a polycarbonate material which is super strong. It is also very light and flexible, which makes it easy to lift and also not so prone to damage. So, when you push on the case it just flexes, instead of denting. Great for increasing the lifetime of your case. The other cool thing I like about the Omni series is the micro-diamond texture of the material (you can see it in the cut-out in the image). Not only does this look great, but it saves it from getting lots of scratches. The top and side handles are nicely aligned for keeping the weight centered when you lift this baby. They also have a cool retracting feature when you lift them, they move up a bit to let you grab them, and when you let go, the retract. Note: The 20in does not have a side handle, but given it's small size, it's not necessary. They are also made out of a quite nice plastic material which does not punish your hands. Although personally, I do not like lifting my suitcase much. Just in and out of the car, or up stairs. For the rest, I use the wheels and telescopic handle. On the Omni, the telescopic handle is quite well designed. The telescope elements are metal and the handle a durable, strong plastic. The Samsonite Omni suitcases have a nice separation between the two sides of the case when it is open. On the bottom, you have a nylon lined section with a zippered side pocket. This section also has elastic straps to keep all your luggage secure once it's packed. The top has a zippered mesh cover to help keep your luggage in when you open/close the case. Once you have used such a set up, you will wonder how you lived without it. Simple, flexible and easy to pack. ​There are three things left to mention about this case. The 4 spinner wheels. They are not the most rugged things I have seen​, but they seem to be up for the job. According to all the reviews I have seen, they roll very well and give you a great 360 degree of travel. You can also tip the case onto two wheels for more rugged terrain (which is what I do with my Delsey). The zippered expander. Running around the case is another zipper (you can see the red tab of the zipper in the image for the lock below) that allows you to expand your case if it is getting too full. This is great as it gives you flexibility - leave it zippered if you don't need the space (securing your luggage better) or expand it to give more room. The Omni cases also come with a built in TSA approved lock, that allows you to slide in the zippers and lock it. This is great if you don't want to bother with a separate lock, or lose it. As it is attached. It is also TSA approved, which means they can open it if they want. 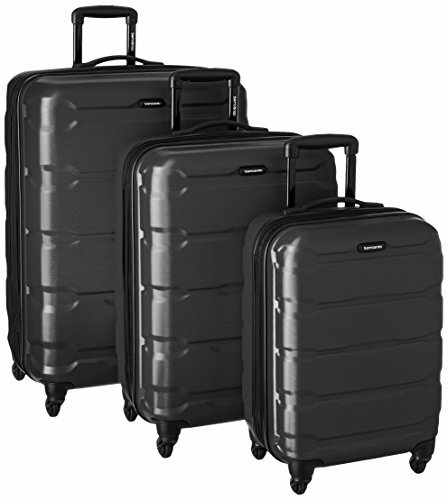 Another popular model from Samsonite is the Winfield Fasion 2 Spinner. This model is quite similar to the Omni above, but the outer case is a lot shinier and ​comes without the micro-diamond pattern. So, there is really not that much difference between this case and the Omni, only the outer shell and look. This one is obviously a little more stylish with the shiny brushed exterior, but just keep in mind it is more prone to scratches and will look old and used far sooner (I have a diamond patterned case that still looks good after 20+ flights, whereas many people complain the shiny ones scratch too easily). The other noticeable feature difference is in the inner mesh divider for the top part of the bag, It has two extra zippered pockets ​for storage. It also has some rubber feet for when you stand it on it's side. Neither feature is going to knock your socks off, but it's the small things that make the difference, right? These days, the Delsey suitcases are on par with Samsonite in terms of quality​ and features. And why wouldn't they be, after all, they started making luggage in Paris back in 1946! There is also very little difference between them in terms of features, so often the choice comes down to price, color or other small things that may be important to you. I have used Delsey almost exclusively for years and traveled all around the world with them, and they are almost unbreakable. The only thing that did break was the zipper tabs/pulls. That meant I had to attach some zip-ties to replace them. Annoying. But otherwise, they were bullet proof!​ Now, I have a new set, and so far, I am super happy with them. 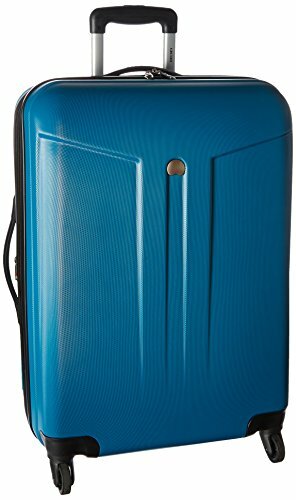 ​The Delsey ﻿﻿Comète﻿﻿ Hardside Spinner is a great choice for a suitcase. It has almost all the features you could want and is made of quality materials that should last you for years. Just like the Samsonite reviews above, I am going to break down this first suitcase into areas, to show you exactly what you get. Just like the Samsonite Omni suitcases, the Delsey Cornetes have a durable and scratch-proof outside material. It is also has a kind of rough diamond pattern, which is not a classy as the fully "shiny" cases, but it will still look great even after a number of runs through luggage belts. I have seen many of these cases at the local terminal and the shiny cases always look worse for wear, even if they are new! And noteworthy here is that even the smallest 20 inch has the side handle, which Samsonite chose to leave off their cases. The top and side handle are also super strong and use the same retractable system that lifts up to fit your hand under when you lift, but otherwise moves back to a more flat position. This is great for keeping them out of the way. The Delsey Cornete opens like a clam, as all the other suitcases due, which is great for packing on two side. On one side you have the elastic straps to hold your luggage in, and on the other a zippered compartment. Where the Delsey goes a little further is to add some zippered comparments to the outside of the mesh on the upper side. ​The Delsey is pretty much a direct competitor to the Samsonite and has the exact same features (more or less) so it's no surprise when I mention these other things. Expandable Zipper. An extra zipper around the case allows you to expand your case up to 2.5 inches (depends on the model). This gives you lots of flexibility in packing and securing your luggage. Comparing the Delsey to the Samsonite we have to take a look at the Delsey Helium Titanium, which is a direct competitor to the Samsung Winfield. Again, this model is on par with the Delsey Comete above, but it's outer material is a bit harder and looks shinier (maybe even nicer). The Delsey Helium Titanium is a great looking suitcase that has all the features, that is for sure. t's a little more expensive than the Comete, but it also comes with a few more features. ​Whether than is worth the difference in price is up to you. Just compare it closely with the others, and all the prices first, because they are all quite similar quality and cost. But, it is certainly a quality suitcase that will fill your needs and last a long time. The Helium Titanium also has a variation in the smallest 19 inch models that has a zip out/tiltable pock​et so you can easily get to your electronics. It only comes in the smallest model and is of course meant for carry on. So, you won't find it in the larger models. Note: Weights on this model are hard to compare as I took them from Amazon and not the manufacturer (I could not find them) so they include other packaging in most cases. There is not much between the different brands and models. Of course, you might also find some variations in price which is always worth checking. When I bought mine here in Europe the Samsonite was way more expensive, so I grabbed the Delsey. 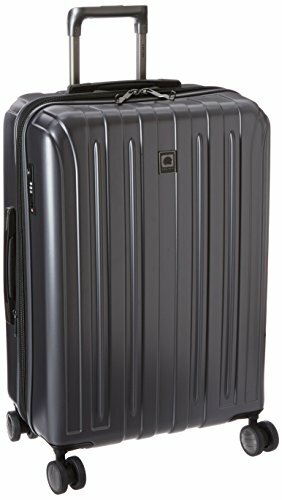 Also keep in mind, once you start checking out the models (all shown again below) you will see some similar models on Amazon which you can also check out now that you know what to look for!​ Both Samsonite and Delsey have huge ranges.